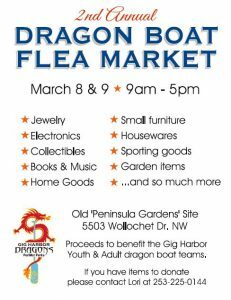 2nd Annual Flea Market to benefit the Gig Harbor Youth & Adult dragon boat teams. March 8th & 9th. Lot’s of great bargains. Located at the Old Peninsula Gardens Site on Wollochet Drive.